February 25 brought the next edition of Trek Up the Tower. 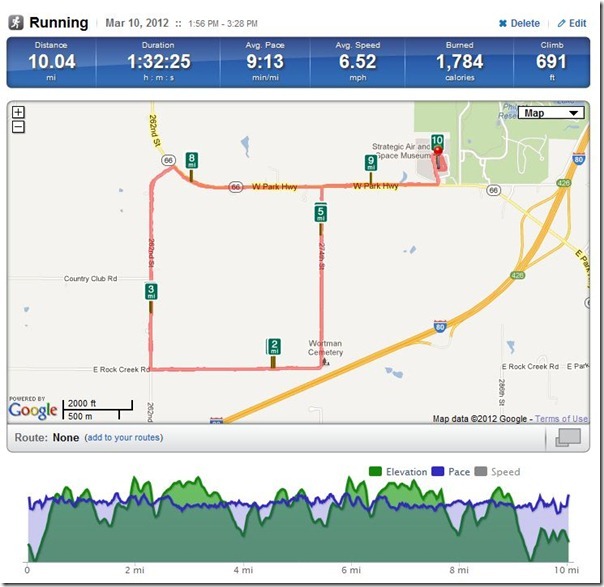 I ran this race for the first time last year and was looking forward the the 2012 version. This event is always well run, limited in numbers and well supported by the community. Last year I climbed the 40 flights in [7:25]. This year was a bit slower. One, I ran alone (last year I ran with Jamie) and two, Dave and I had scheduled a 13 mile run after the climb. Below are the results as well as the link to last year. 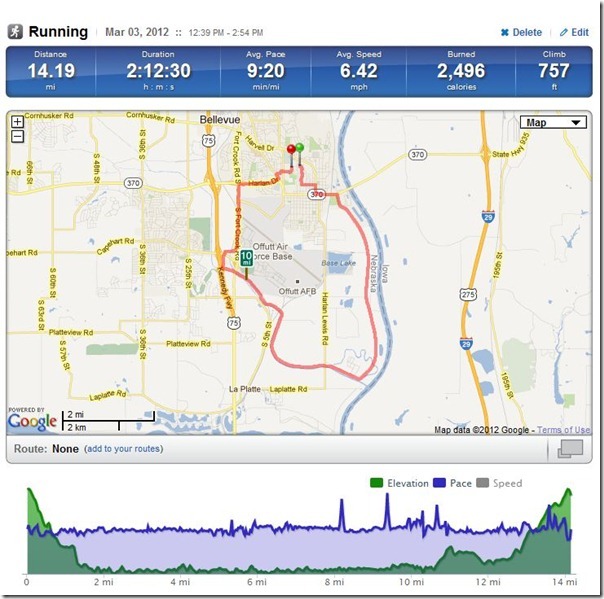 Half Marathon Training – Dave and I ran a new route that I had run alone a couple of weeks before. It starts at Gallup, heads south to the South Omaha Bridge, turns left into Council Bluffs IA and winds it’s way back via Casino Row. Hilly in the beginning, it turns mostly flat after mile 5 and has lots to look at as it runs through a few neighborhoods. 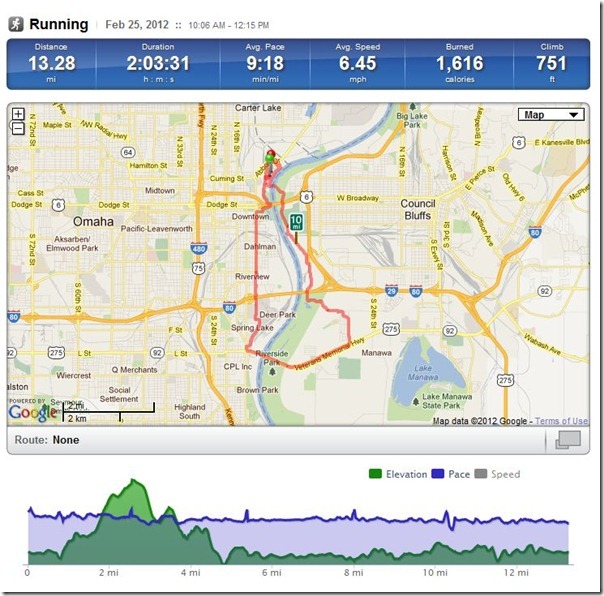 March 3rd (the next weekend) had a scheduled 13 mile run. I had to run it alone and wanted to run a route that I had run from my front door once before. The easy choice was the Offutt Loop. Only one problem, I had heard it was still closed. The summer flood from the Missouri had done some damage to the trail and I guess I thought I knew better. Running from my house down to Hayworth park was easy since it is mostly down hill. At the park, the closed sign had been knocked over making way for me to run through the barrier. The park is still a bit of a mess but I was able to get to the trail. The first 6 miles were with the wind, open and clear. The second 6 was a different story. Around the back side brought wind and some iffy trails. Some of the trail was washed out, some was covered in 3 inches of mud and some were just not there. I had to run around obstacles, over some train tracks and even some cross country. It was a real mess. Once I reached the trail head of the Keystone on the other side of Offutt, I was back on city streets and home free. Up the hill on HWY 370 and back into Bellevue. Tough run, but not impossible. Was wiped out most of the weekend. 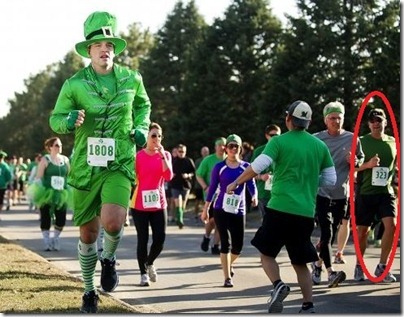 March 10th brought a 10 Mile training run followed by the 3rd annual Leprechaun Chase. Since I had 16 on the schedule, I planned the route in advance. Looking on Google maps before I left for the race, I saw that there was a great course that I could run without having to go too far from the race site itself and not have to run the route of the chase. It was a good deal. Again, it was a warm and windy day. I headed west from the SAC Museum and made the first left. Dirt and totally unimproved road with rolling hills. Again, tough but not impossible. Two loops around the square, music playing from Pandora, a couple loops in the parking lot and an hour and 30 minutes later I had finished the goal of 10. Now on the the chase! I even made the photo gallery over at the Lincoln Journal Star. Look to the right in the picture. All in all, 3 very hard weeks of training in preparation for Lincoln on May 6th. Still many miles ahead. March is off to a good start. 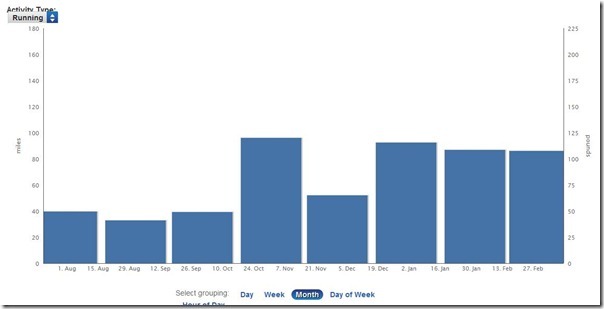 Here is a snapshot of my miles so far. March still has 11 days left.